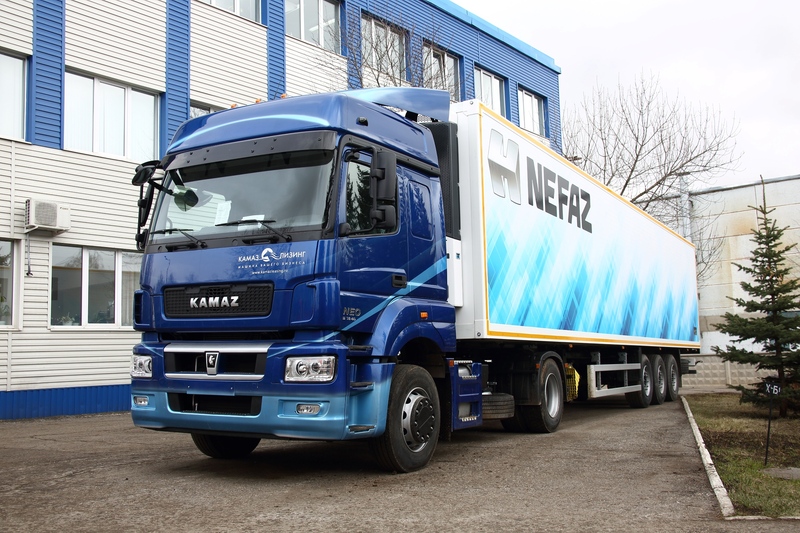 At NEFAZ, a subsidiary of KAMAZ in Bashkortostan, the production of a new model of a semi-trailer refrigerator has been mastered, which ensures efficient transportation of cargoes with observance of a given temperature regime. According to the KAMAZ trade and finance company, the NEFAZ-93341-5300314 refrigerated semi-trailer has high consumer qualities, low weight and meets modern requirements: it has a lightweight chassis frame structure, is equipped with the Wabco brake system, and the Aspock electrical equipment set. The van is made of a metal frame, and the walls are made of special sandwich panels. The thickness of the side walls is 65 mm, the floor panels – 121 mm. The walls and roof of the van on the outside and inside are protected with fiberglass sheets, as an insulation, extruded polystyrene foam is used. To maintain the desired temperature, the refrigerator is equipped with Thermo King refrigerators. The temperature is regulated by the control panel, which is mounted on the side of the van. The main advantage of the novelty is the use of fiberglass instead of traditional metal. Fiberglass has a higher resistance to aggressive media (it is not susceptible to rotting, corrosion), there are no residual deformations during impacts. The combination of a fiberglass van and a lightweight frame made of imported steel made it possible to achieve a reduction in the weight to 8220 kg, which is one of the best indicators in the class. The presentation of the new semi-trailer refrigerator was held on July 9 as part of the dynamic display of KAMAZ’s innovations in Kazan. Visitors appreciated the consumer qualities and design features of the novelty.